Many religions have an "end times" scenario. It is recognition that life as we know it will not last forever. There is often an expectation of something new coming from the destruction of the old, whether it be new cultures rebuilding in the ruins of old ones, or a judgment that allows entrance into a physical or spiritual paradise. Certain religions, however, hold their apocalyptic beliefs to be fairly central in their overall theology. Destructive cults, particularly those that result in mass suicide, are commonly apocalyptic, but that doesn't mean apocalyptic religions have to be destructive. Due to the negative connotations of the term “apocalyptic religion,” care should be taken in its application. The belief that there will be an apocalypse sometime in the future without the need to act upon it falls outside the common understanding of apocalyptic religion. Atheists, for example, believe the world will eventually end. They simply believe it will come from a natural phenomenon, which is not an apocalyptic belief. To be an "apocalyptic religion" there needs to be a sense of urgency. Christianity certainly has an apocalyptic component to it, however, the amount of emphasis varies greatly. Some Christians are convinced that the end times will be very soon upon us, and some even think the apocalypse is already here. Plenty of Christian sects fall outside of the category of "apocalyptic religions" because they don't feel the need to act upon it. However, the more one emphasizes the nearness of this apocalypse, the more apocalyptic they become. 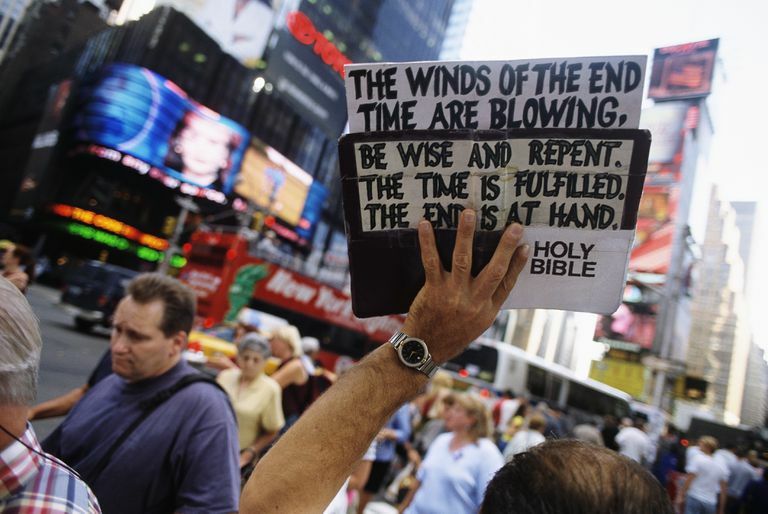 Those carrying signs reading “The End is Near,” who make choices based on the approaching end are apocalyptic, or who expect the Rapture to shortly occur are all more correct in being labeled apocalyptic. David Koresh led a splinter group of the Seventh Day Adventist Church called the Branch Davidians at Waco. He believed and taught his followers that he was the returned Jesus Christ—something that is commonly accepted in Christian end-times scenarios. With the second coming of Christ, the Branch Davidians believed that the end times was already upon them and was expected to get worse. Koresh's followers largely separated themselves from the rest of society in their compound at Waco where they collected weapons and supplies. They viewed themselves as part of the righteous few who would be pressured to join the ranks of the anti-Christ, which might include anyone who disagreed with them—including the government. Heaven's Gate teaches that creator aliens periodically recycle life on earth, destroying and then rebuilding. It is vitally important to be accepted as a spiritual equal to these aliens before that happens so that they may be carried away or at least reborn (if they haven't fully succeeded in their spiritual enlightenment) before this event occurs. Believing that a spacecraft hiding in the comet tail of Hale-Bopp might be their last lifeboat from earth, many members consented to mass suicide to free their souls from their earthly forms and hopefully gain entrance to that craft. The Raelian movement was originally strongly apocalyptic, although that component of their teaching has lessened throughout its progression. Originally, their leader Rael taught that the Elohim—who created human life on earth—would destroy humanity if we did not develop into enlightened beings in the very near future, embracing things such as social justice, equality, and tolerance and rejecting war. That message was soon clarified to state that it was expected that humans would destroy themselves through nuclear holocaust if they did not follow the directions of the Elohim. They believe that the Elohim also wishes to visit, but first, man must show that they are ready. If people do not build an embassy for the Elohim before 2035, the Elohim will abandon them and mankind will never benefit from meeting their progenitors. Even that date is now up to more interpretation among the Raelians, however. In addition, while having the Elohim arrive would be a decidedly good thing, fewer and fewer Raelians are seeing the lack of an appearance as being particularly bad.